In addition to our detailed demographic chart for the top 40 cable originals, check out our new expanded searchable table for the top 100 cable originals at the bottom of the post. NETWORK UPDATE: THE BIG BANG THEORY usually does very well with afternoon adjustments, and it rose 0.2 once again, bringing it to 3.4 (although that’s still considerably below where it was at this time last year). The first hour of GREY’S ANATOMY grew by 0.1, but AMERICAN CRIME lost the same. BONES went up 0.1. There was no comfort for THE BLACKLIST or THE VAMPIRE DIARIES, both of which remained at their series lows. CABLE HIGHLIGHTS: The NFL DRAFT was the #1 show of the night, with a 3.04 rating on ESPN and 0.86 on NFL Network, but those numbers were down quite a bit from the 4.59/1.10 they scored last year. TNT’s NBA PLAYOFFS doubleheader stayed strong with 1.66 for the Clippers/Spurs game and 0.69 for Chicago/Milwaukee. Syfy’s WWE was down 0.08 to 0.64. On Spike, LIP SYNC BATTLE fell a big 0.22 to 0.59. The NHL PLAYOFFS (NBC Sports Network) made their Top 10 debut with a 0.42 game. A&E’s THE FIRST 48 was at 0.42 and 8 MINUTES fell 0.07 to 0.20. 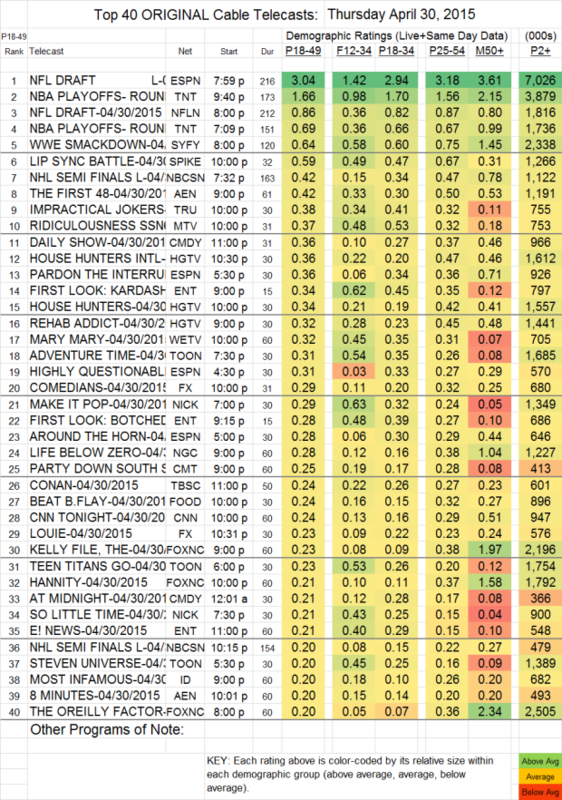 IMPRACTICAL JOKERS (Tru) dropped 0.09 to 0.38. RIDICULOUSNESS (MTV) rose 0.02 to 0.37. MARY MARY (We) stayed at 0.32. On FX, THE COMEDIANS gained a tenth to 0.29, and LOUIE rose 0.03 to 0.23. DIG (USA) dipped 0.02 to 0.19. OLYMPUS (Syfy) held at 0.16. Among the micro-rated, HBO’s THE CASUAL VACANCY fell 0.02 from Wednesday to 0.04, with 124K viewers; THE RED ROAD (Sundance) edged up 0.01 to 0.03 with 165K viewers; and SMALL TOWN BIG DEAL (RFD) continued to be exceedingly small, with zero registered 18-49 viewers and a nearly nonexistent 18,000 total viewers.